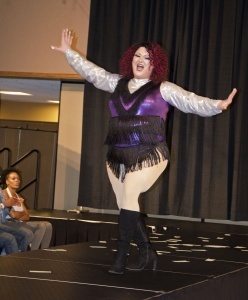 YSUnity presented their annual drag show in the Chestnut Room of the Kilcawley Center at Youngstown State University on Friday night for an energetic and actively involved audience. The organization has been holding the event for 19 years to raise awareness for sexuality, gender and inclusivity at YSU and to have fun watching the drag queens perform. The show was hosted by Mya Garrison and featured several other local performers. “YSU was very loving last year … The energy was high, and the pride was flowing heavy which is awesome,” Garrison said. She said having a drag show performance is a chance for her to inspire people. She also said it promotes the various sizes of drag queens. Garrison said she is humbled and honored that she has been able to host and perform at the past two drag shows. Carissa Brennan, president of YSUnity, said she feels appreciated and sees some improvement in the support of the LGBTQ+ community such as individual supporters and some posters around campus. Brennan said last year there was a person who was not a YSU student preaching about how homosexuality is wrong, and she said she had to call the YSU police. She said the YSU police are very helpful when needed. Although Brennan was worried about getting audiences due to financial issues, the Chestnut Room was almost full. Catherine Cooper, YSU graduate student in the department of counseling, school psychology and educational leadership, said she has been a member of YSUnity since 2013. She said the LGBTQ+ community inspired her and helped shape who she is today because she grew up in Los Angeles, where she was surrounded by the community. She explained that there is an importance of taking action and not to be just an outlay, but to be an advocate.